Thinking about adopting a dog from a pet shelter? Great! Pet shelters are overflowing with happy, friendly dogs just waiting to find a new home. Unfortunately, there are quite a few misconceptions about pet adoption at shelters, plus some considerations you might not have thought of before. So below, we’ll go over 5 things you’ll definitely want to consider as you move toward dog adoption at a pet shelter. #1 – Don’t believe the myth that all shelter dogs are badly-behaved. You can easily trust that most pet shelters carefully vet their dogs for behavior and health. In fact, you can generally read bios of each dog to learn more about his or her personality, disposition, likes and dislikes, and more. #2 – Do take time to choose a kid-friendly and/or animal-friendly dog if need be. If you have kids or other animals at home, read the dogs’ bios at your local shelter, and talk to shelter staff about how the dogs you’re considering will react. Some shelters will allow a “trial period” of a night or two to see how your family gets along. #3 – Realize when adoption isn’t a good idea. Lots of people want dogs to be a part of their family. But it’s just not always possible. If you work long hours, are regularly away from home for several days at a time, lack enough funds to properly care for a dog (food, a bed, medicine, shots, licenses, vet checkups, etc. ), dog adoption may not be right for you. #4 – Remember that welcoming a new dog into your home will be a process. Don’t be surprised if your new canine family member takes some time to adjust. You’ll probably notice lots of panting and pacing, shyness, crankiness, or just lots of sniffing. That’s natural. Don’t take it personally, and they’ll calm down after a while. #5 – Your first priority after adoption should be a checkup at the vet. All set to adopt? Awesome! 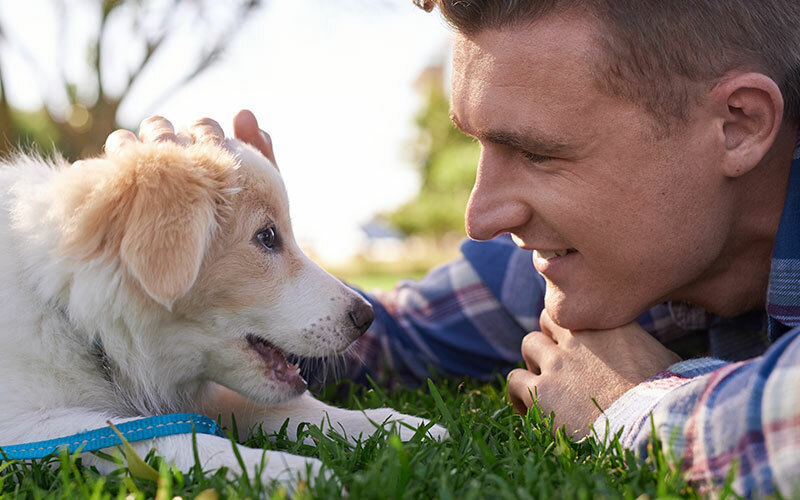 It’s time to book your first new-pet checkup! Our vets at Sunset Veterinarian Clinic are ready and waiting to make sure your new dog is happy and healthy and ready to move in. Contact us today to book an appointment!